Tests show my son is dyslexic but the school doesn’t acknowledge it because he falls in the average range – even though the discrepancy is huge. I was told my daughter was too bright to be dyslexic. My child’s school doesn’t believe in dyslexia. I am fighting to have an evaluation for my child. Now, as a dyslexic adult, anxiety affects every part of my life. can be given accommodations. I just don’t have the money. There is good news. Initial steps towards developing public policy have now been taken. The Shaywitzes are part of that momentum. First bit of history. Two decades or more ago the Americans with Disabilities Act was enacted. Congress intended a broad range of people, including those who are dyslexic, to be protected by the law. The Shaywitzes feel that both United States Supreme Court and testing agencies (like the College Board and the National Board of Medical Examiners) have chosen to interpret the ADA in a way other than as Congress intended. In the case of dyslexia, they have interpreted it to only those who are severely limited for coverage by the ADA— a seeming disregard of the spirit and intent of the ADA and scientific evidence pointing to the absolute need for the accommodation of extra time for people who are dyslexic. These situations are what the Shaywitzes and others are now working to correct. Dr.Sally Shaywitz’s presentation moved to content for this public policy. To begin is the definition of dyslexia. 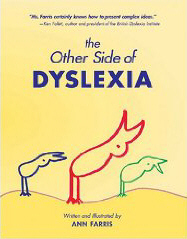 The Shaywitzes have an unusual twist in defining dyslexia. Unusual because it focuses on the positive. To them dyslexia is an unexpected difficulty in reading, unexpected in relation to: intelligence, motivation, educational status and professional work. Why? Because dyslexics are most often very successful in these categories. Most dyslexics have a high IQ. However, they have a neurobiological disruption in the neural systems in the brain which affects their ability for rapid reading. Instead, they suffer the result of extremely slow and effortful reading. This means that their cognitive ability indicates they have the capability to master complex and very difficult conceptual material within a college and graduate or professional school curriculum even though they experience such impaired reading fluency. Interestingly, this is not necessarily the case for an average person with the same reading difficulties. So, a one sentence definition of dyslexia, according to the Shaywitzes is: dyslexia can be conceptualized as an encapsulated weakness resulting in slow reading surrounded by a sea of strengths. It is the sea of strengths in thinking and reasoning that, together with the accommodation of extra time, allows a slow-reading but good-thinking dyslexic to succeed. The accommodation of extra time on test levels allows the hardworking dyslexic to access his strengths and demonstrate his knowledge. What do we know about reading and reading ability? The Shaywitzes reminded us that we as human beings evolve to speak, not to read. Every society has a spoken language. We are hard wired to speak, not read. In fact, there are many societies that con’t read. Reading is not natural. It has to be taught. It is acquired. Print has meaning because it represent letters and then words. Letters, lines and circles, have taken on meaning when they link to the spoken language. Writing is a way of reporting language with visible marks. To translate the written words, the word is dissected through the use of a phoneme, a smallest unit of speech. These phonemes become building blocks of language. The challenge for a dyslexic is retrieving the sound. Sometimes a dyslexic may retrieve the sound which is next to the letter in question resulting in he or she saying the wrong word: eg eat, instead of cat. In other words readers have to be able to pull each word apart and then blend the sound. For dyslexics, attaching a letter to a sound is very difficult. Dr. Ben Shaywitz focused his comments on the neurobiology of dyslexia pointing out that the better the neural system works in the brain, the more fluent the reader. His research proves that dyslexics neural systems differ from skilled readers. Brain imaging (MRI) has made it possible to observe that there is a neurobiological difference between dyslexic and non-impaired readers: not in intelligence, but in the systems that allow readers to read rapidly. This fact reinforces that dyslexia is real. In other words, what has been replicated is the fact that dyslexics have an inefficient functioning of neural systems for skilled and fluent reading. Dr. Ben Shaywitz continued by explaining there are three areas of the brain that are affected. All are found in the left hemisphere of the brain: two in the back brain (responsible for integration, phonology, orthography, semantics etc.) and one in the front brain (executive functioning). These differences hold true for dyslexic individuals from many languages. Dr. Ben S. summarized his comments by stating that brain imaging has taught us that dyslexia is real and caused by an inefficient functioning of the neural systems. However, he was quick to point out, that, at this point, there is no imaging process to diagnose a dyslexic. for inclusion in national public policy. dyslexic individual, be they a child, adolescent, young adult or adult. a reflection of the scientific progress and approaches in the dyslexic condition. support this statement through the data of the clinical proof. the reasons behind the importance of accommodations for dyslexics when taking tests, along with the requirement that this opportunity become mandated through public policy. Now, I am going to focus on a few comments the Shaywitzes told the gathering about how we, the public can get involved in assisting in the dyslexic public policy process. Recently there has been a bipartisan caucus in the House of Representatives organized to support the public policy on dyslexia. This is spearheaded by Representative Pete Stark (D) from California and Representative Bill Cassidy MD, (R) from Louisiana. If you live in Rep. Pete Stark’s district send him an email through his website http://www.stark.house.gov. Go to contact/public comment supporting the importance of this endeavor. Similarly, if you are from Louisiana and live in Rep. Bill Cassidy’s district, go to http://www.cassidy.house.gov/contactBill. In addition, Congress is considering the ADA Restoration Act right now. If you want to make a difference, you can help by writing (email) to your Congressional Representative or Senator. Tell them you do care and you very much want to see dyslexia included in the ADA Restoration Act. There was a great deal of content in the Shaywitz presentation. I strongly recommend a visit to their Yale website. www.dyslexia.yale.edu to learn more. I also used this Site to help me as I was writing this blog to clarify some of the information that we heard at the lecture. In fact, I used some of the language on their site as the articles are very clearly written and most helpful. If you are interested in more details in the dyslexia public policy effort read the following two articles posted on the Shaywitz website.